There is a pair of jeans for every occasion. Denim jeans – whether ripped, straight, flared, vintage or raw – are one of the world’s most-loved garments. But from fibre to wardrobe, they have a considerable ecological footprint. Given the diversity of cotton growing enterprises and clothing producers around the world, tracking the environmental impact of a pair of cotton jeans is no simple feat. But as a denim-wearer you can make more sustainable choices by buying responsibly, extending your jeans’ life with gentle washing and choosing to repair, not replace. In this guide we’re looking at the key stages of jeans’ life cycle: cotton cultivation; spinning and dyeing; manufacturing, distribution and retailing; and what happens after you get them home. Let’s begin with the cotton crop, in which water and pesticide use are prominent environmental issues. Cotton is a thirsty crop, using 3% of the world’s irrigation water on 2.2% of global arable land. However, better management can reduce water wastage and improve efficiency. Like humans, insects and bugs are attracted to the pillowy white fluff that is actually the fruit of cotton. Traditional cotton farming is chemically intensive, but genetically altered cotton varieties and innovations in integrated pest management have almost halved insecticide use (from 25% to 14% of global insecticide sales) since the 1990s. Organic cotton crops use no synthetic chemicals, but yields are typically lower than that of conventional cotton, and organic cotton represents less than 1% of the 25 million tonnes of cotton grown globally. Its water consumption is similar to non-organic cotton. However, organic producers in developing countries can charge a premium for their crops and aren’t reliant on synthetic insecticides and pesticides. If you want to buy organic cotton jeans, you can check for brands accredited by the Global Organic Textile Standard. To improve cotton cultivation standards globally, the not-for-profit organisation Better Cotton Initiative was established in 2005 to promote more sustainable cotton growing, with better practices across water use, land and pest management and social indicators. Major fashion retailers like Levis Strauss & Co., H&M, The Gap, Kathmandu and Burberry are focusing on sourcing Better Cotton, organic, or recycled cotton for their clothing. 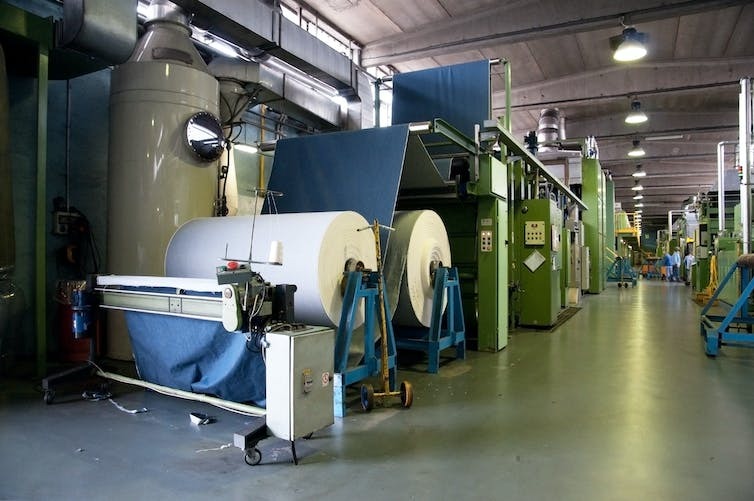 The process of spinning fibre into yarn, yarn into cloth, and manufacturing cloth into clothes represents some 70% of the total energy consumption of creating a pair of jeans. The iconic indigo colour and the broken-in look of denim are the result of chemically intensive and high water use treatment processes that can take a toll on workers’ health and safety and impact the environment. Leading denim brands are actively promoting techniques that limit the chemical and water intensity of wet processing, like enzyme finishing, laser etching and ozone treatments. Initiatives such as Zero Discharge of Hazardous Waste work across the apparel supply chain to tackle this problem. You can check their website for a list of brands that have committed to better practises. Denim manufacturing is chemically intensive. It may come as a surprise, but a large part of the environmental impact of a pair of jeans occurs after you buy them – how you launder and care for your jeans, and for how long, can be crucial in minimising denim’s ecological footprint. Throw-away fashion is a huge problem: a survey of 1,500 British women found the majority of garments (not just jeans) are worn as few as seven times. You can minimise your jeans’ footprint simply by washing and drying them less often. We often launder far more often than needed, and overwashing may be more from habit than actual dirtiness of garments. In a 2012 study, participants wore the same pair of jeans unwashed for three months with no ill effects. Any smells or stains were simply managed through airing or spot cleaning. Jeans have a patina of use that factories work hard to simulate – but you can develop your own patina through wear over a lifetime. Forward-looking denim brands are embracing longevity, with Nudie jeans offering repair services, and Levi Strauss promoting durability and a personal connection to one’s clothing. New business models promote a circular approach to consumption: you can rent your jeans from Mud jeans, and at the end of your jeans’ life, Mud will collect them for reuse or recycling. If buying new, purchase from retailers actively sourcing responsibly grown cotton. Check for standards and certifications like Better Cotton or the Global Organic Textile Standard. 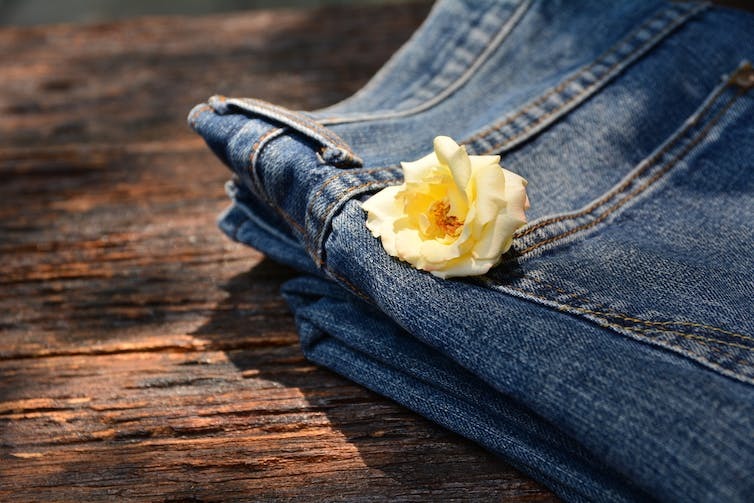 Look for retailers that promote environmentally friendly processes, such as enzyme-washed denim or waterless denim. You can dig into your denim retailer’s sustainability statements on their website to see if they have signed up to initiatives to tackle hazardous chemicals, such as Zero Discharge of Hazardous Waste, or if they have their own scheme in place. Remember that the most sustainable pair of jeans is the pair you already own. Care for your jeans by laundering them lightly and less often, using a cold wash cycle and line drying. Freshen them up between washes by hanging them in the sun or in a steamy bathroom. Most importantly, extend their life by repairing them if damaged, and give them that patina of use through wear.